Lift and place trusses with the extended reach of the truss boom attachment. Designed for the VersaHANDLER® telescopic tool carrier, the rugged 12-foot boom is built specifically for moving trusses on construction jobsites. 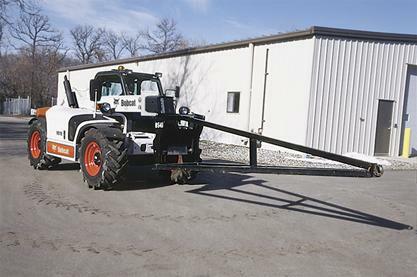 Fingertip controls operate the attachment, accurately placing trusses without ever having to leave the operator cab, maximizing operator comfort. Speed up construction jobs with the accurate lifting power of the truss boom attachment. Achieve a variable range of lift heights and reach lengths with the extendable boom of the VersaHANDLER telescopic tool carrier. Reach into the highest truck and over fences, stockpiling and stacking materials higher for more space or to backfill hard-to-reach areas of a jobsite. The VersaHANDLER offers outstanding rated load capacities, powerfully lifting loads high into the air. For better stability and reduced flex, they feature a light, rigid frame and a wheelbase that is long and powerfully built. Fingertip Controls: Precise fingertip controls allow an operator to place trusses exactly where they are needed for accurate jobsite performance. Bob-Tach™ Attachment Mounting System: Makes hooking up and disconnecting attachments quick, easy and secure.